The delicate Cherokee rose was selected as the state flower of this southern state in 1916 at the urging of women’s gardening clubs. The elegant white rose is an open petal flower that grows on an evergreen climbing shrub. 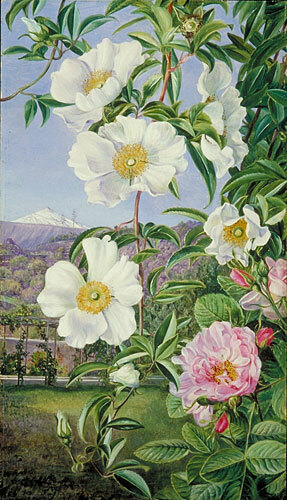 Introduced from China sometime in the 1700’s, the Cherokee rose has gained fame for its aggressive growth, lovely beauty and emotional history. The Trail of Tears that marked the forced march of the Cherokee Indians off their ancestral lands in the 1838 has become intertwined with the Cherokee rose. Grown by the Native Americans before the march, it was said that the tears of the women that fell during the dramatic event turned into the small white flowers that still grow along the pathway today. Then and now the Cherokee rose was a symbol of hope and a change of fortunes. Lovely in the garden and growing very easily in the Georgia climate, it’s a natural choice for a state flower. The hardy Cherokee rose grows easily in all weather conditions, including drought making it ideal for a southern state. The Cherokee rose is especially aggressive climbing over other shrubs and plants to reach up to thirty feet high. The waxy flowers have a bright yellow center and are small as they cover the plants. The Cherokee rose is heavily covered with thorns as well with brightly colored green leaves. The rosehips from the rose have been used medicinally for years, especially in China where the plant originated. The Cherokee rose is easy to grow from bare roots or a small shrub. Once planted, the Cherokee rose is hard to stop. Long hooked thorns catch on fences, trellises, tree branches and other shrubs as the evergreen travels up and out using long shoots to continue climbing. When in bloom, the small white flowers appear in clusters all over the plant making even the offshoots of the plant particularly attractive. Gardeners working in a small space will want to be sure that the climbing rose doesn’t overtake other plants in a garden. This entry was posted on Monday, March 8th, 2010 at 8:12 pm	and is filed under American Flowers. You can follow any responses to this entry through the RSS 2.0 feed.